For garlic growers like myself that do all of their garlic planting in the fall, spring is a pretty care free period. Particularly if your garlic is grown in fertile soil and the bed is mulched with a thick layer of shredded leaves or straw during the fall months. Fall planted garlic is usually the first vegetable plant to make an appearance in my garden each spring. There are often signs of new leaf growth as early as mid to late February here in Zone 6, well ahead of even the early spring flowering bulbs. The first spring garlic chore is to check the beds to make sure that the garlic leaves are able to penetrate the mulch that was used to protect it over the winter. 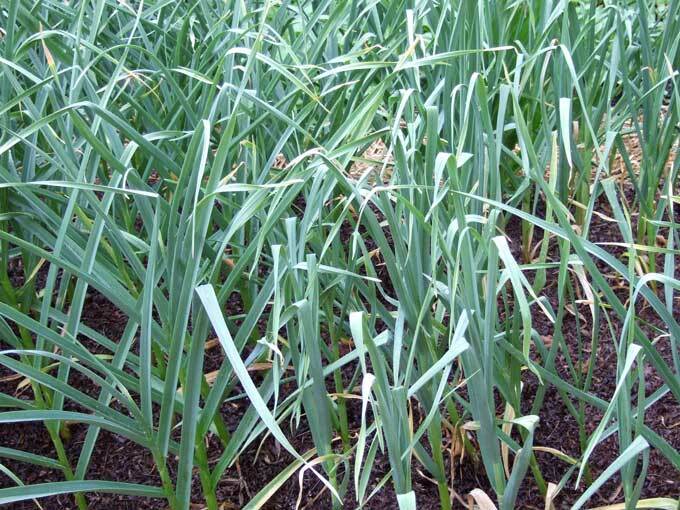 This isn’t an issue if you used shredded leaves or straw as a mulch, but whole leaves can become matted and prevent the garlic plants from reaching the surface. If your garlic plants are growing in spirals trapped beneath the mulch you can rescue them by pulling the mulch away from the base of each plant. It’s better to eliminate this potential problem altogether, simply by shredded the leaves before use. Don’t completely remove the mulch from your garlic bed as it will perform many functions in addition to insulating the plants and guarding against heaving during the winter months. 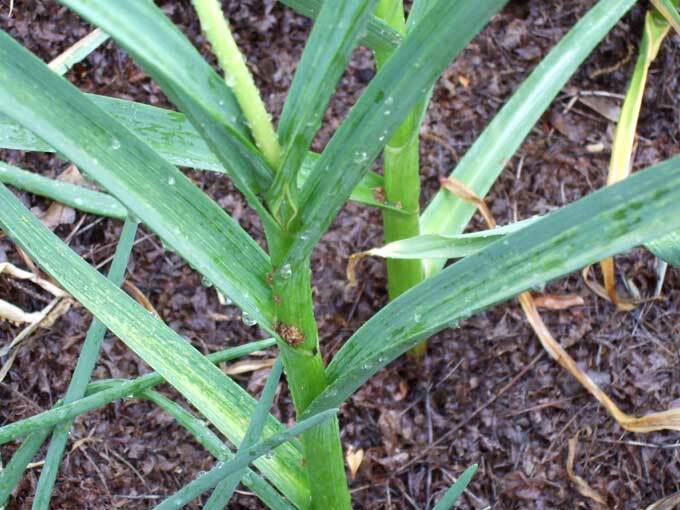 A thick mulch in the garlic bed will also reduce or eliminate weed growth throughout the garlic growing season. In addition the mulch will help to conserve moisture and keep the soil a little cooler which is fine in the case of garlic plants. The only negative that I can think of to leaving the mulch in place is that it can sometimes attract and provide cover to animals such as rabbits and chipmunks. One year I discovered a nest of baby bunnies nicely camouflaged right in the center of my garlic bed. That’s it for taking care of the fall planted garlic bed during springtime. It’s about as close to maintenance free as you can get. Depending on the condition of your soil you may want to begin feeding your plants with a nitrogen rich fertilizer in early spring also. You can side dress or scatter fertilizer onto the soil, but with the mulch in place it’s a lot easier to mix a liquid fertilizer such as seaweed or fish emulsion with water and spray the mixture onto the leaves of the garlic plants. Raising homegrown garlic will also give you the opportunity to enjoy fresh garlic greens, spring garlic, and baby garlic long before the mature bulbs are ready for harvest. With this in mind I usually plant a section of the garlic bed a little closer together and use the plants that are thinned as garlic flavored spring onions in the kitchen. 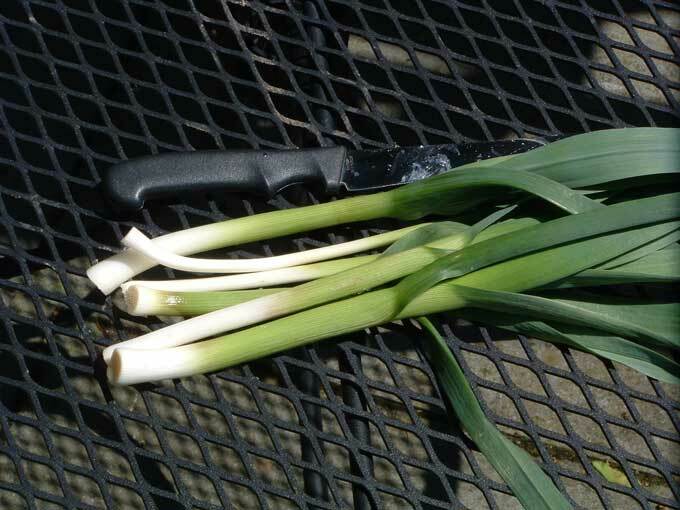 I’ll post another article later this month with ideas for summer garlic care, but I can tell you now that there isn’t any more involved than the simple steps to care for your garlic plants during the spring. Thanks for the tips and info! I actually did not mulch my garlic over the winter, but it seems to be doing OK. My current question is when I will know that it’s ready to come out of the ground — I am not sure how long it’s supposed to stay in there. I’m looking forward to using what I grew, though! Genie, it’s not easy to judge when garlic is ready to harvest without actually digging up a bulb or two. As the garlic approaches maturity the leaves will start to dry up and die. When forty to fifty percent of the leaves have turned brown you can dig a bulb up to see if it has reached a harvestable size. I’ll post an entry here in a few weeks with a more detailed write up on harvesting garlic and curing the bulbs for storage. Kenny, that’s good info — thank you! I’ll look forward to that post when the time comes. hi I would like to know if is possible how to grow the spring garlig in september so I can have e spring garlic around new year or if possible allong whole winter because I do use them for my restaurant during the winter do the spring garlic grow in low temperatures if no then how about closed plants I mean in areas covered or how do you call them because I don`t know the exact word that if yeas then please explain me how can I grow them durining this period of the year. Our company is a professional exporter for fresh, dehydrated, Deep-processing garlic, ginger, onion, shallots, etc. The company locates in shandong province, CHIINA, take the advantage of the rich resources and convenient traffic, the company closely meets the worldwide customer’s requirements, push ourselves into the export of all kinds of agriculture products. We mainly offer all kinds of fresh vegetable, dehydrated garlic powder, garlic flakes, garlic paste, fresh and frozen peeled garlic, garlic granulates, decorated garlic braids, etc. Previous post: What’s a Tomatillo?